2. P can give Q a start of 20 seconds in a kilometer race. P can give R a start of 200 meters in the same kilometer race. And Q can give R a start of 20 seconds in the same kilometer race. How long does P take to run the kilometer? kilometer, then P will take x – 20 seconds to run the kilometer. kilometer, then Q will take y – 20 seconds to run the kilometer. Therefore, P will take x – 20 = y – 20 – 20 = y – 40 seconds to run a kilometer. and P takes only y – 40 seconds to run the kilometer. We also know that P can give R a start 200 meters in a km race. This essentially means that R runs 200 meters in 40 seconds. Therefore, R will take 200 seconds to run a km. If R takes 200 seconds to run a km, then P will take 200 – 40 = 160 seconds to run a km. 3. A takes 3 min 45 seconds to complete a kilometre. B takes 4 minutes to complete the same 1 km track. If A and B were to participate in a race of 2 kms, how much start can A give B in terms of distance? A can give B a start of 15 seconds in a km race. Therefore, B will cover a distance of = 62.5 meters in 15 seconds. The start that A can give B in a km race therefore, is 62.5 meters, the distance that B run in 15 seconds. Hence in a 2 km race, A can give B a start of 62.5 * 2 = 125 m or 30 seconds. 4. Middle earth is a fictional land inhabited by hobbits, elves, dwarves and men. The hobbits and elves are peaceful creatures that prefer slow, silent lives and appreciate nature and art. The dwarves and the men engage in physical games. The game is as follows. A tournament is one where out of the two teams that play a match, the one that loses get eliminated. 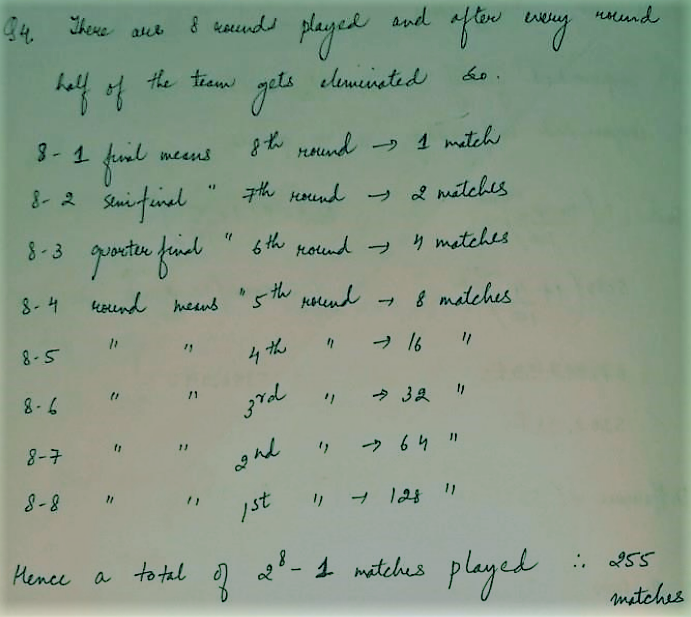 The matches are played in different rounds, where in every round; half of the teams get eliminated from the tournament. If there are 8 rounds played in knock out tournament, how many matches were played? 5. In a game of 80 points. A can give B 5 points and C 15 points. Then how many points B can give C in a game of 60? 6. A can run 3 Kms in 3 min 18 sec and B can run same distance in 3 min 40 sec, then by how much distance A can beat B? A takes time = (40-7)= 33 Sec. 8. A can run 1.5 km distance in 2 min 20 seconds, while B can run this distance in 2 min 30 sec. By how much distance can A beat B? A takes time 2.20 min. = 140 Sec. B takes time 2.30 min. = 150 Sec. Diffrence = (150-140) = 10 Sec. 150 Sec. = 1500 m.
B covers 100m in 25 seconds B take time =(4000*25)/100=1000 sec=16 min 40 sec. A takes time =1000 sec-25sec=975 sec= 16 min 25 sec.